Grey’s Point Quilted Bedding is lovely!. Oh Deer! A cream background highlights the sketch-like features of the centerpiece. 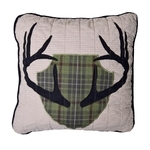 A mossy green plaid with a black, taupe, forest gree, dusty navy, and charcoal accent border adds to the contrast of the Buck. 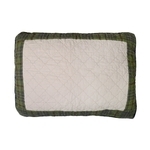 Decorative throw available separately and carry the theme throughout your room. 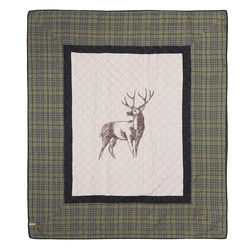 King 3 Piece Set - King Quilt, 2 Shams 20" x 26"
Queen 3 Piece Set - Queen Quilt, 2 Shams 20" x 26"
Deluxe 4 Piece Queen Set - Queen Quilt, 2 Shams 20" x 26", Deluxe Pillow 18" x 18"
This handsome, lodge-inspired quilted bedding collection features a large embroidered white-tailed deer surrounded by a rich plaid border. Colors include taupe, forest green, dusty navy, black and charcoal. Our coordinating shams, accent pillows and throw carry this theme throughout your room. Standard Sham: 20 x 26". Coordinating items sold separately. Throw Quilt: 50" x 60".